Live recordings generally struggle to live up to the excitement of the day. They are a great souvenir for fans but sometimes a sonic nightmare for the artiste. Without doubt, the night of Saturday 24th June when Jeff Lynne's ELO landed at London's iconic Wembley Stadium will always be at the head of my fave gigs of all time for very many reasons. So when it was announced before the concert that it was being filmed and subsequently in early October that the audio/visual multi-media "Wembley Or Bust" was just a month or so away, Yours Truly KJS was excited yet a little apprehensive as to what would transpire. I needn't have worried. If the trickle of footage via ELOVEVO hadn't allayed any concerns, then listening to opening track "Standin' In The Rain" on the CD did. Thereafter the cascade of classic ELO songs (plus a Traveling Wilburys gem) reignited fond memories (and the odd tear of joy) as that jubilant June evening was replayed through my headphones. The 2CD and 3LP editions are worth their weight in Eldorado gold alone. My only issue with "Wembley Or Bust" is that the endless fade outs do somewhat reduce the continuity of the record as a live experience. Then comes the Paul Dugdale directed film "Wembley Or Bust". Other reviewers have commented that the many rapid cuts from stage to audience footage were, to them, a distraction. But one has to remember that this is a film as opposed to a filmed concert with some quite wonderful panoramic views, superb audio quality and, in places, a commentary by Jeff and the band himself. 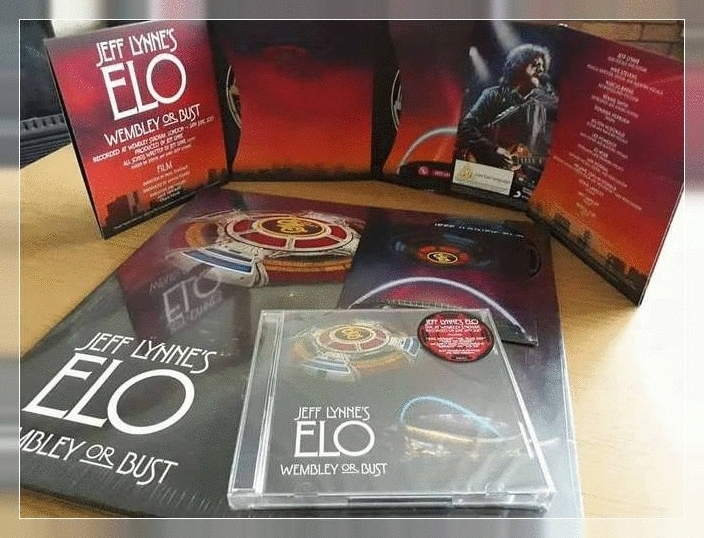 It works for this writer as a fantastic capture of ELO's 2017 Wembley spectacular, not least when you get to see the behind the scenes whilst the likes of "Birmingham Blues", "Believe Me Now", "Secret Messages" and "Alone In The Universe" provide the soundtrack. It's a film that not only lives up to expectations, it exceeds them. In terms of the songs on show, the promotional bandwagon makes much of the inclusion of "Xanadu" and "Do Ya" - and quite rightly so. I loved seeing/hearing "Prologue/Twilight", "All Over The World" has become an ELO anthem to rival "Mr. Blue Sky" and what better opener can there be than "Standin' In The Rain"? We were treated to a set that ticked all the boxes so picking faves is hard! The songs that relay the energy of an inspired performance and constitute my faves at the time of writing are: "10538 Overture", "Turn To Stone", "Ma Ma Ma Belle", "Do Ya" and "Can't Get It Out Of My Head" - this, of course is subject to change! Thanks for the review! I enjoyed reading it. I may or may not pick up this release as I do have the Live In Hyde Park release.